Ed Lotto directs the Writing Program and the Writing and Math Center. He specializes in composition and rhetoric, regularly teaching first-year writing. He also teaches courses in composition pedagogy and theory, as well as the practicum for new Teaching Fellows. He frequently teaches a course on the Environmental Imagination that seeks to explore the role of the natural world in grounding our knowledge and beliefs. On occasion he teaches a course on the contemporary American novel that sometimes considers the work the label “classic” does in our society and other times explores the American dream of freedom. Most recently he has indulged in a general education course called Visions of Evil, which examines the differing conceptions of evil in The Lord of the Rings, The Dark Materials, and Harry Potter. In all his teaching he is concerned with the role of language in shaping our world. 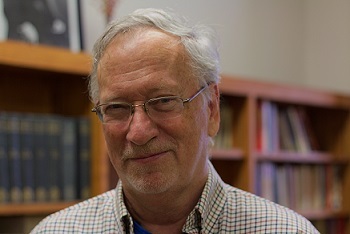 His publications include articles about writing centers, grading, the complex role of academic prose in our society, Basic Writing, the difference between writing and speech, nature as a ground for knowledge, and a reader on American nature writing. Presently he is exploring the role John Burroughs played in shaping our understanding of nature in the late 19th and early 20th centuries. He has recently finished a term on the University Steering Committee where he learned altogether too much about the Rules and Procedures of the faculty.